The Sea King helicopter which is being transformed into a cafe. Inset: the Sea King in action as a search and rescue helicopter. A Scarborough man is hoping to restore a helicopter to her former glory by transforming it into a seaside cafe. Businessman, Ben Stonehouse, 25, purchased the Sea King chopper at an auction and, after spending more than £10,000 already, is now looking for investment in order to propel his dream into a reality. Ben Stonehouse, who purchased the helicopter at an auction. The Sea King, a former Search and Rescue helicopter based at RAF Leconfield, will be renovated into an upmarket cafe in the hope of creating a unique experience for residents and visitors to Scarborough. Ben is currently locked in talks with Scarborough Borough Council in order to find a suitable location for the Sea King Cafe. 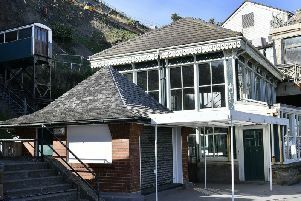 The Moonlight Cinema owner had hoped the Sea King could be based at the old Royal Albert Cafe site, but he admits it is not a possibility. The Sea King has been transported to a location in Scarborough where work will take place to get plans off the ground. Ben said: “I will need help from former RAF engineers that worked on these great machines. “Hopefully we can be open for the summer season with a number of jobs being created too. However there is lot of work to do and without the help of the public it might take years. Donated funds will be spent on sourcing parts, restoring her to her former glory, obtaining any planning required and technical drawings among much more. Ben is offering a number of incentives to those who invest in the Sea King Cafe project including free coffee for a year, customised T-shirts, a private launch party, your name on a rotor blade and the opportunity to name the helicopter. A total of more than £1,300 has been raised out of a £5,000 target with Ben admitting there is a long way to go. To donate, go online to www.crowdfunder.co.uk/sea-king-cafe.